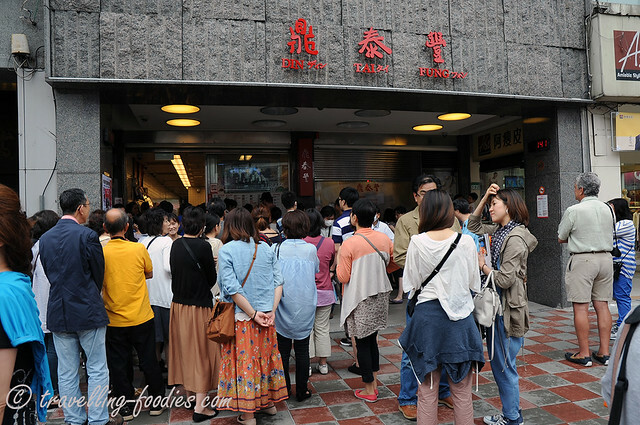 Strangely of all our trips to Taiwan all these years, we’d never been to 鼎泰豐 Ding Tai Fung（DTF）. This is very odd I know, given how iconic DTF is in Taiwan’s culinary scene, being featured in perpetually every single guidebook we’d read in the past. Somehow, we’d never really felt compelled to visit, often brushing it off as a tourist gimmick and most rightfully so. This is often the first place we would pass by whenever we visit 永康街 Yong Kang Street in 大安区 Da’An district. The front door is always packed with tourists from Japan, Korea and of course Mainland China, sent here by the busloads. It often got so bad that the crowd started to spill over to the shop windows of the bookstore next door. We were often put off by this sight and would briskly walk away, shaking our heads and rolling our eyes. But we’d tried DTF back home in Singapore many times and I must say that we thoroughly enjoyed the food there. While the loud and chattery crowd outside the main shop in Taipei irked us to no ends, we often wondered if the food there is better than what we are getting in Singapore. DTF originated from Taiwan after all. Finally, curiosity got the better of us and we made our first proper visit to DTF after all these years. The already crowded DTF which is strategically located at the entrance of Yong Kang Street. But this comes as no surprise to us already as we’d seen worse gathered outside the shop front. Groups of tourists of various nationalities gathered outside the shop, some of them hurdled into a tight ball staring intently at the order chit given to them, discussing their orders. Being able to read Chinese and speak Mandarin naturally worked well here as our intentions could be easily explicated to the front staff with ease. But even for those who don’t speak the language, they have staff who are bilingual and some even trilingual in Japanese, Korean, English and Cantonese, amongst others. I must say that I am thoroughly impressed by their command of the foreign languages they speak. Decent to say the least, able to hold a good conversation and put all these tourists at ease. So if you don’t speak Mandarin, fret not. Just look out the pinned badges on the uniforms of these staff for your own country flag and I’m quite sure they would be able to greet and help you with your orders. Despite the crowd, we were given a table fairly quickly but it was on the fourth or fifth floor. So manoveuring up the narrow flights of stairs can be a challenge as there are constantly people walking down. Despite the number of levels, there isn’t an elevator so folks travelling with elderly or physcially disabled folks might wish to put forth a request to be seated on the first floor when handing over the order chit. We ordered some appetisers, anticipating that our orders may take some time to be prepared given how crowded the place is. First is their 开胃小菜, a cold dish with thin strips of firm beancurd, bean sprouts, rice vermicelli (冬粉), spring onions, red chilies and kelp being tossed in a savory sauce with somewhat sweet and sourish hues as well. The crunch from the vegetables together with the piquant flavours makes this dish very refreshing to say the least and definitely helps to work up an appetite. 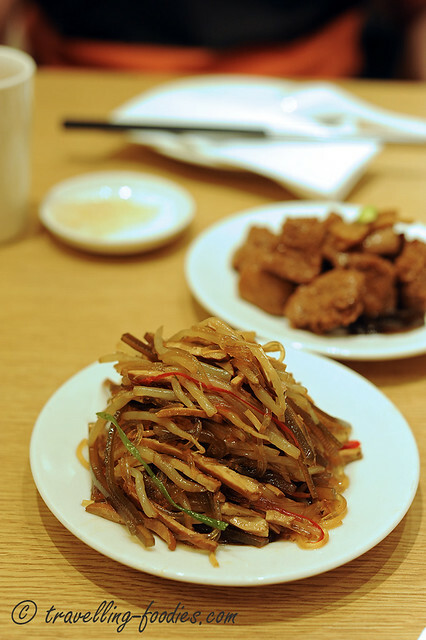 The other appetiser we had is 烤麸, gluten cooked in Shanghainese style. 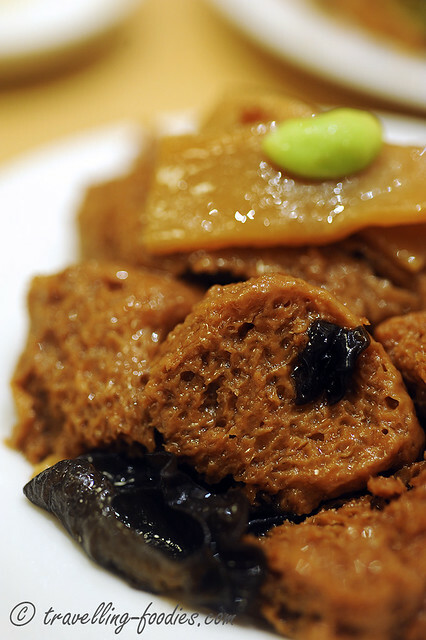 This is a classic cold dish in 江浙菜 Zhejiang cuisine. The gluten cubes have completely soaked up all the rich savory and sweet sauce making them very flavourful and succulent! At the same time, black fungus and sliced bamboo shoots lend a delightful crunch to the dish making it very moreish! Morsels of gluten which had been left fermented and steamed creating the honeycomb like effect to soak up all the richness from the accompanying sauce. Seemingly simple, the true mastery of this dish lies in control over the balance of flavours. It should be rich but yet no cloying, allowing one to enjoy one piece of it after another and trust me, once you start, you wouldn’t wanna stop! After our trip, we revisited this dish at one of the DTF outlets in Singapore but unfortunately, it didn’t do as well as the version we had in Taipei. So the standards across the branches ain’t really consistent. 猪排蛋炒饭 is another of our favorites at DTF. The fried rice had the right texture, soft yet individually grained. The whole dish permeated a delightful aroma from the eggs and spring onions added, as well as good “wok hei” from the hot kuali used. This is often what we look out for in good Chinese cuisine. 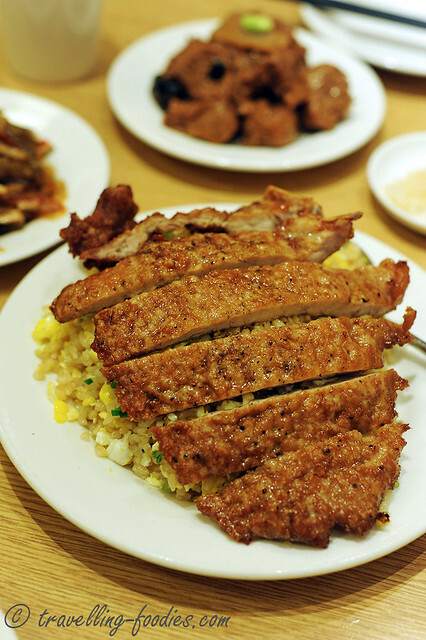 The fried pork cutlet is done Shanghainese style, i.e pre-marinated but deep fried without any batter or flour coating. Reasonably hot oil has to be used so that the surface cooks instantly to seal in all the meat juices within. This also prevents the pork cutlets from absorbing too much oil. Well executed. We loved this dish back in the DTF outlets in Singapore and this one in Taipei did not disappoint us as well. 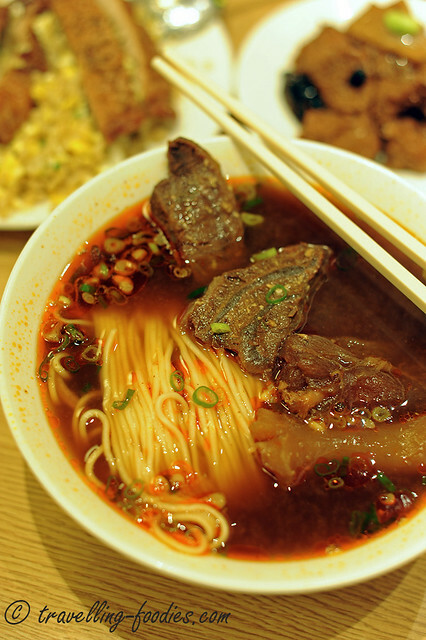 Another dish which we would order whenever we visit DTF is their 红烧牛肉面 Braised Beef Noodles. The soup broth is very rich but oily at the same timey. But that is only expected as the dish maintained the culinary traditions of old school cooking. The health conscious may frown upon seeing the layer of red oil that floats above the flavourful broth beneath but we weren’t too bothered by it. Beef shank is used with lovely layers of collagen and tendon interspersed between the meat. The portion was reasonably small for what it was priced and there was only one piece of tendon, my favorite part! But still pretty much worth a try though I won’t think this is the best we’d had given the options available in Taipei! Finally, no visit to DTF is complete without sampling their famous 小笼包 xiao long bao steamed pork dumplings., Well-known for how delicately each individual piece is made, the skin is uber thin allowing the collagen rich soup within to peek through, as seen in the first photo. The famous 十八折 “eighteen folds” to close the opening is yet another sight to behold. Count to see if there are eighteen folds all in all! The small amount of broth packed within is already bursting with flavour but enjoying them with a small amount of young ginger as well as a dip made from 浙醋 Zhejiang vinegar and light soya sauce brings the whole palate experience to an entirely new level. Despite how good they taste, they were ranked only No. 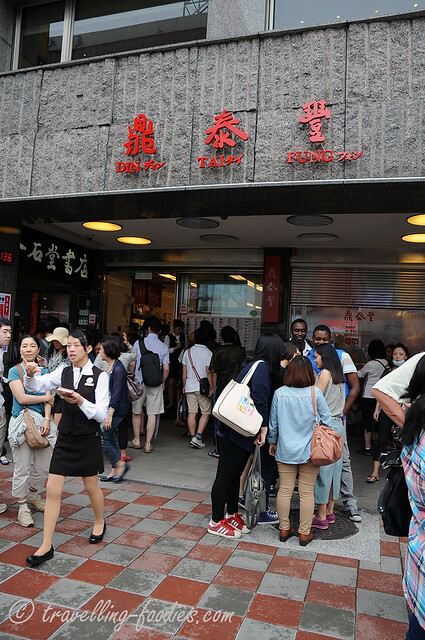 2 in all Taiwan when it comes to steamed pork dumplings. But they are very good already, probably the best we’d had to date, until we give No. 1 a shot during our next trip! And as we leave, the crowd outside just got wilder and bigger. But at least we’d finally tried the DTF in Taipei. I think the standards for the DTF outlets in Singapore are fairly consistent compared to Taipei. At least the one at Paragon basement is pretty good we thought. I’m glad to know that we could enjoy DTF in Singapore as much as we did in Taipei, without the crazy crowd that is. It is not better, but at least we know it is good enough. This entry was posted on December 13, 2013 by Alan (travellingfoodies). 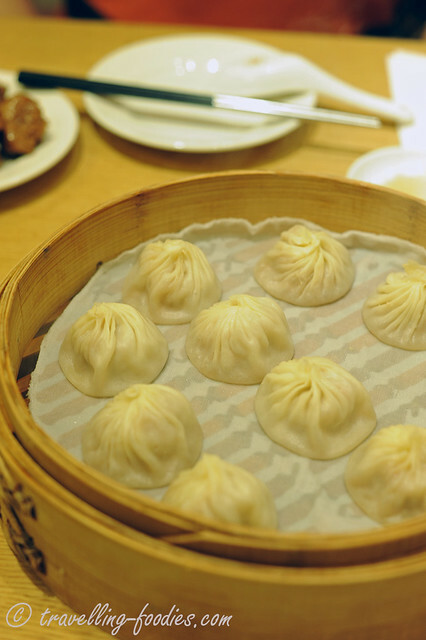 It was filed under Food, Travel and was tagged with 烤麸, 红烧牛肉面, ding tai feng, ding tai fung, 鼎泰豐, 鼎泰丰, fried rice, la mian, Taipei, Taiwan, xiao long bao, 台北, 宁波菜, 小笼包, 开胃小菜, 排骨蛋炒饭, 永康街. 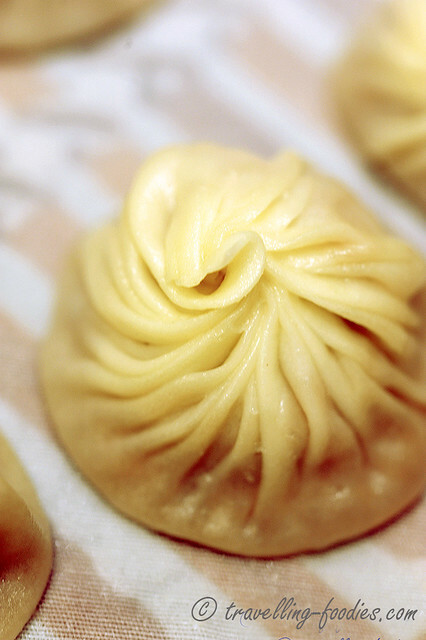 Can you remember the price of just the standard pork dumplings alone?